What do ball bearings have to do with the future? Everything, if you believe these ads from the 1950s. New Departure-brand ball bearings ran a number of print ads to position themselves in the minds of consumers as forward thinking. Like in this beautiful illustration from 1956. This “Cargo Catamaran” discharges loaded barges, plucks newly loaded ones from dockside… nests them high and weathertight to its central hull. Cargo and barges are rushed intact to destination, where unloading and reloading occur with minimum port time. When this “shipper’s dream” slips down the ways, New Departure ball bearings will still be first choice—aship or ashore—wherever shafts must turn with maximum efficiency, speed and dependability. Leading industries just naturally look on New Departure products and engineering service as shipmates for smooth sailing. 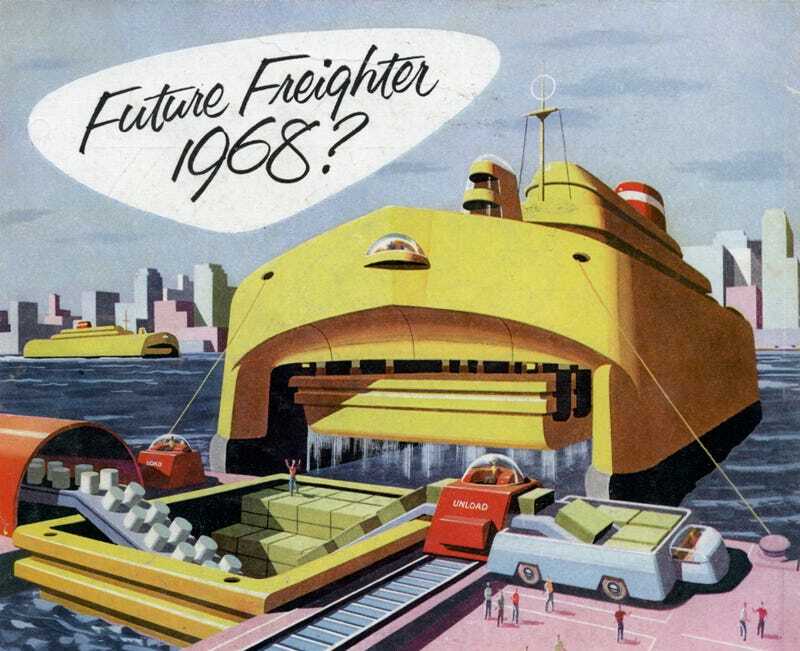 There’s not a lot to unpack (sorry) in this illustration, aside from the fact that their automated unloading of barges may not be spot-on in style, but they certainly were correct in spirit. Gizmodo’s own Alissa Walker recently looked at the futuristic technologies driving today’s ports. We got these robots in places like Amazon warehouses (and, of course, in various forms at today’s docks), they’re just a bit less midcentury-future in style than 2015-future.